Household Choking Hazards and Your Dog - Is Your Home "Dog Safe"? Household Choking Hazards and your dog just seem to go hand in hand. Dogs are exposed to choking hazards everywhere! It is not unusual for a dog to find small objects on the ground or on the floor. When they do, they will almost always pick it up and start chewing on it! Puppies are especially good for this. As a responsible dog owner it is your job to make sure that you make your dog’s environment completely safe for them at all times. Your job is to make sure any item that is small enough for your dog to get in its mouth is out of its reach. These items include things like pencils, pens, crayons, small toys, plastic bags, coins and any other items in that size range. Household choking hazards are not the only danger your dog can encounter in the home. Household chemicals and cleaning items when left within easy access can also be dangerous! Always make sure that chemicals and cleaning items are keep out of reach or locked away. Also keep trash containers containing food waste, packaging and scraps out of your dog’s reach at all times. While commonly found in our homes, all of these items can easily become a great danger to your dog. Small items can get caught in a dog’s throat causing choking, strangulation, intestinal problems and even death. Furthermore, chemical poisoning is almost always fatal. If your dog has swallowed something it will show one or more of the following signs of choking or distress. If your dog is choking and you can see the object in its throat you should attempt to remove it. Never put your fingers inside the mouth of a choking dog. 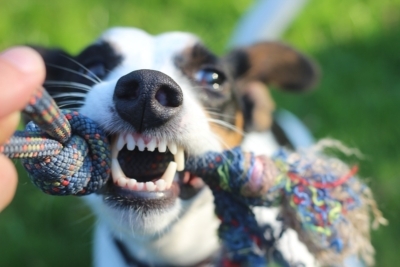 Your dog may be the sweetest dog in the world, but it will bite you when it is in distress! Instead, we suggest you use a metal spoon or a pair of kitchen tongs. If you can’t see the item, or if your dog is having trouble breathing, call your veterinarian or your local Pet Hospital at once. At this point, every minute counts and your dog may be only minutes from dying.